. :: Elica Editions ::: Marco Bertoni ::. 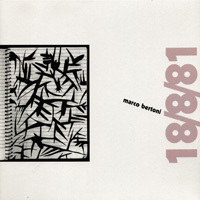 After quitting the outstandingly original and enjoyable Italian group Confusional Quartet (see Elica UPP-3210), keyboard player Marco Bertoni, upon the invitation of the Quartet's fifth member, recording engineer Gianni Gitti, recorded a handful of pieces for piano and studio work which had eventually to be released on record by Les Disques Du Crepuscle, a product that never materialized. The piano tunes here have a playfulness and a nonchalance of Satiesque inspiration, exposing an intimate world which reveals through simplicity and primitive studio inventiveness, with a production emphasising the idea of sketches and of artisan work. In these eight short pieces, the piano tracks are superimposed, speeded up or down, deconstructed and generally played with, although most of the time left in their original unmodified beauty, with street cats, breathings, Italian radio-dramas, Russian radio voices, bird recordings and fellow CQ Gianni Cuoghi's drum elements discreetly adding to them through Gianni Gitti's studio touch. Released on vinyl record instead of compact-disc, considering this format to be more appropriate to the nature of this music, the album comes with full-color fold-out sleeve with reproductions of original drawings and texts by Marco Bertoni and is an edition of less than 400 copies.